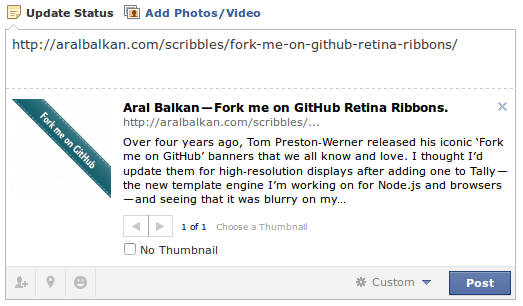 When you include one of these fork-me-on-github ribbons on your website and share the link on facebook, the little thumbnail that the link shows will most little be that ribbon. That’s because Facebook uses the Open Graph Protocol – also a facebook invention – to get this information. If there is non specified, it will use the first picture availble, which is most likely the github ribbon. The solution is to use an image with at least 200x200px and the og:description tags for a text next to the picture. 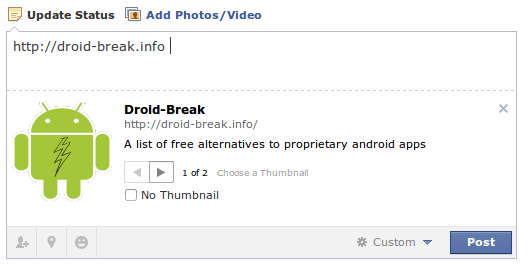 By the way: your website is more likely to be found on the facebook graph search if you do this right.